- This jacket runs 1 size small. Example: If you normally wear a 44 Reg, order a 46 Reg. 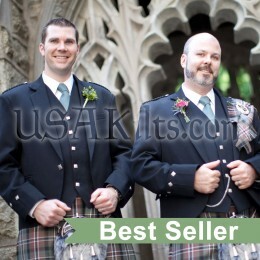 Are you looking for a slightly “less formal” way to dress up your kilt? Take a look at our tweed jacket and vest combo! Tailored in a 15 oz, 100% wool Tweed, these jackets have the same look and are just as hard wearing as our custom tweed jackets, but we keep them in stock! 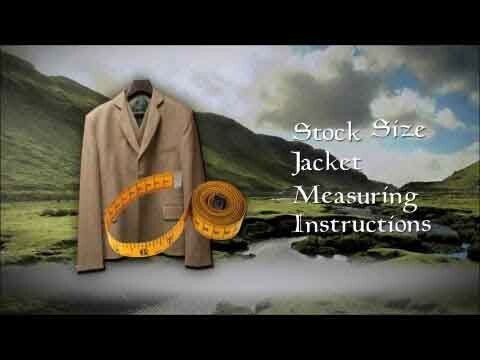 Please note that this jacket is generally held in stock at our shop and by our supplier in Scotland. Turnaround on this jacket is generally less than 3 weeks. Sizing: this jacket is made in the UK and is slim fitting. If you normally wear an American suit jacket size 42 Reg, please order a size 44 Reg. If you normally wear a 48 Long, order a 50 Long. There are several different styles of jackets (and vests) which span the scale from daywear to formal. 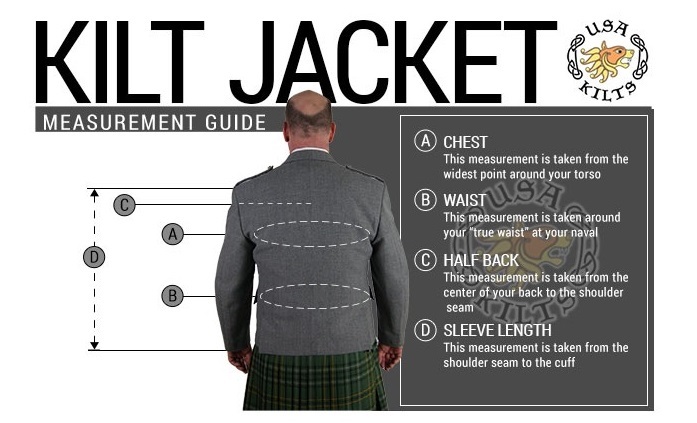 This is a quick guide to our jackets and their appropriate level of dress. Prince Charlie jacket and vest: The Prince Charlie jacket and vest (also known as a PC Jacket) is worn for formal (black tie) events. In your mind, equate this jacket to a ‘tuxedo’ type outfit. Places you’d wear a tuxedo, a PC would be appropriate. 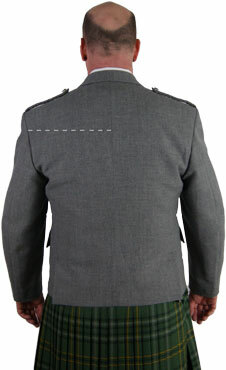 Argyll jacket (with or without vest): This is one of the more versatile jackets. It’s a bit dressier than a Tweed jacket and less formal than a PC. In a situation calling for khakis and a blazer, the jacket (no vest) could be worn with the kilt and not be overdressed. When worn with the vest, the outfit could be worn in place of a ‘nice suit’. Also, the vest provides a bit of versatility in itself… you can wear it alone with a shirt and tie or leave off the tie and roll up your sleeves for a casual dressy look. Grey Braemar or Tweed jacket (with or without vest): Very similar in cut and style to the Argyll, this jacket and vest is made from tweed cloth, giving it a little bit of an ‘earthy’ or ‘natural’ feel. In Scotland, it’s still often worn to dressy functions (much like the Argyll), but here in America, we often relegate tweed jackets to ‘daywear’. That NEED NOT be the case. If you’re going to be a guest at a wedding, you would look perfectly fine in a tweed jacket and vest. 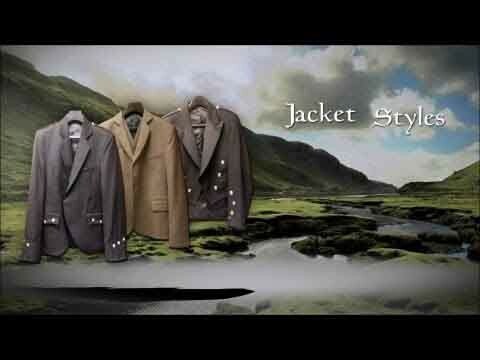 Brian Boru jacket and vest: The Brian Boru jacket and vest is effectively the Irish equivalent of a Prince Charlie (see above)… it is worn for formal (black tie) events. In your mind, equate this jacket to a ‘tuxedo’ type outfit. Places you’d wear a tuxedo, you can wear a Brian Boru. Kilkenny jacket (with or without vest): The Kilkenny jacket and / or vest is effectively the Irish equivalent of an Argyll (see above). 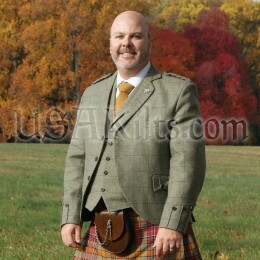 In a situation calling for khakis and a blazer, the jacket (no vest) could be worn with the kilt and not be overdressed. When worn with the vest, the outfit could be worn in place of a ‘nice suit’. Also, the vest provides a bit of versatility in itself… you can wear it alone with a shirt and tie or leave off the tie and roll up your sleeves for a casual dressy look. Welsh Prince Charlie jacket and vest: The Welsh PC jacket and vest are similar to their Scottish Prince Charlie counterpart, but differ in the details… they have gold buttons (not silver), red dragons embroidered on the epaulette and come with or without Welsh tartan accents. Like the Scottish PC jacket, they are worn for formal (black tie) events. In your mind, equate this jacket to a ‘tuxedo’ outfit. Places you’d wear a Tuxedo, you can wear a Welsh PC. 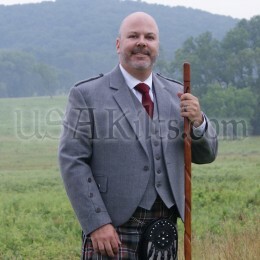 The Doublet: These are worn mostly by pipe bands and military organizations for formal dress. They would be worn in place of a military dress outfit.